Last Monday, the entire faculty participated in a day-long in-service focused on Social Emotional Learning (SEL) and 21st century skills. 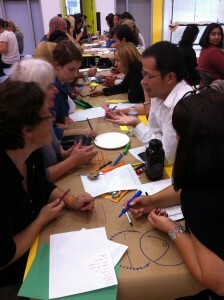 We reviewed research and theory, and then engaged in activities and active learning. The day was facilitated by trainers from the Nueva School who were impressed by the way ISTP teachers embraced the day and shared thoughtful questions and insights along the way. 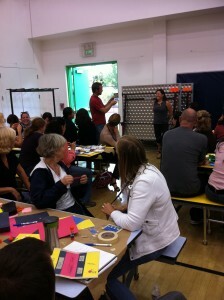 The elementary school teachers spent the afternoon in a workshop centered on Design Thinking. 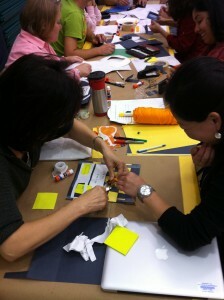 In this workshop, they were paired up and asked to go through a process to invent a better wallet for their partner. The process focused on active listening, brainstorming, considering ALL possibilities, drawing as well as writing, creating a quick prototype, and trying to use empathy to design a product that would truly fit a need. Part of the point was to engage in a process, and to focus on what 21st century skills we can learn just by going through a process, regardless of the content. It was also meant to show how aspects of SEL can be essential in “real life”. It was important to give time and energy to listening and thinking, as well as coming up with ideas, in order to get to the truly innovative thinking. It was important to be able to identify the feelings of the other person and put oneself in his/her shoes to design something that could really make a difference. And it was important to access various routes to expression in order to articulate and show what one was trying to do. All of these are part of learning focused on process, not product, and are invaluable life skills. 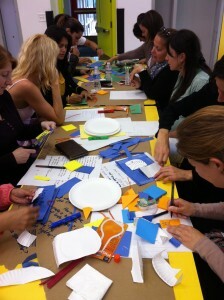 The experience not only put teachers into the shoes of students, and got them thinking about how they learn and create, but it also got them to connect with others and share how they teach and learn with other teachers from different backgrounds. These types of connections are the connections we hope our students will make, and why we are working on more explicit social emotional learning at ISTP. In a bilingual immersion school with multiple cultures, being empathetic, exploring outside of the box, and being an engaged learner are necessary as well as a natural part of what happens. I look forward to sharing more of our experiences and the experiences of our students at the SEL workshop on November 16.